Since the birth of sharing economy, the free floating bike sharing (FFBS) has acquired a central role and its importance has a continuous growth. If a company is prepared for the opportunities, which are given by free floating bike sharing, it can rise up its business model in a context of responsible and sustainable progress. The idea of TMR is to simplify the experience of the users of free floating bike sharing mixing all in an hybrid experience. The company of Sant’Agata di Militello (little town in the province of Messina) is ready to take up the challenge coming from China. In the county of “great wall”, users can locate, unlock and use the bike without a bike sharing station and return the bike in a station, for example. This is the news: we have to change our idea of standard services. Bike sharing can become a green factor in city experienced by traffic, but at the same time it will serve the small city, increasing the lifestyle. With youBike®, TMR has already started to work in this direction, developing the app in any aspect, with particular attention on user experience. 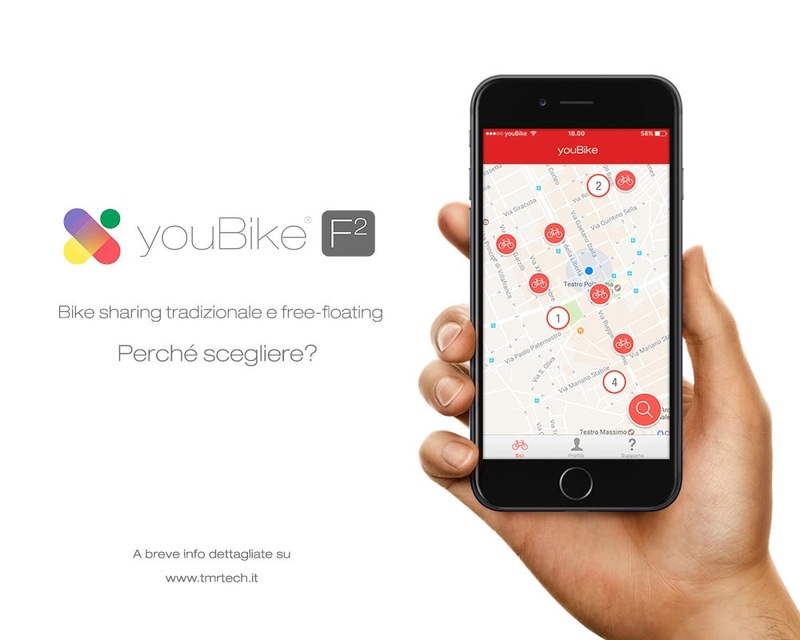 This is the aim of youBike® F2, a cutting-edge project with an already tested integrated system, in order to translate in Italy the ideas of free floating bike sharing. It is well known that Italian audience is not easy, but it is fascinated by the possibilities of bike sharing more than in the other part of the world. This is the perfect environment for the diffusion of a simple and usable approach like the one of youBike® F2. Approching to the future with an amazing view!!! Ideas, designs and emotions are the main guidelines to our works, providing best solutions to our customers’ needs. This is our present and future mission! Monday - Friday: 9.00 a.m. - 1.00 p.m. / 3.00 p.m. - 7.00 p.m.
All right reserved - TMR S.r.l.